Merchants, scholars, travelers, warriors people- moved across the Silk Road and established the Eurasian region through economic, cultural and institutional networks and interactions. A millennium later, Asia is still connected, but now by different kinds of forces of globalization such as neoliberal restructuring, international normative regimes, spread of pop culture, transnational flows of workers, refugees, expats and students. While scholars examine the human landscape of Asia at the global and subnational levels, the Asian state is often regarded as an object of curiosity in this historical journey with regards to their relations with the forces of production and their citizens as well as with the international system. 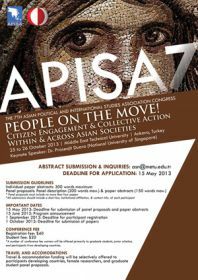 The annual congress of Asian Political and International Studies Association (APISA), which was previously held only in East and Southeast Asia, is now to be held for the first time in the western edge of Asia. 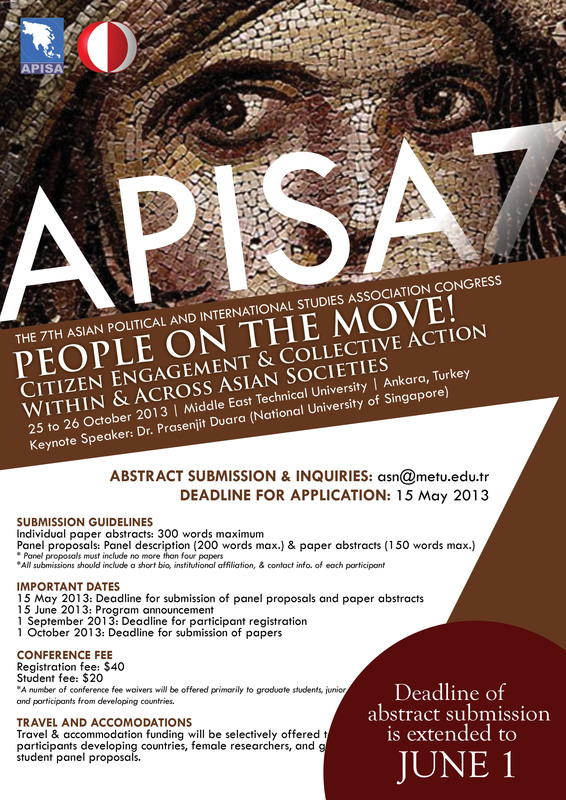 APISA 7 at Middle East Technical University (METU) offers an opportunity to discuss, compare and contrast domestic dynamics as well as regional and international connections within Asia and with the West. It is also an opportunity to assess the conceptual and methodological tools we employ in understanding Asia and evaluate how Asian scholarship communicates with other epistemic communities and, finally, where do we go from here. producing theoretically informed knowledge about Asia in a comparative perspective. providing new perspectives to current issues and themes in various social science disciplines through scholarship on Asia. Panel proposals are encouraged and may be considered for special issue publications. * A number of conference fee waivers will be offered primarily to graduate students, junior scholars, and participants from developing countries. Travel & accommodation funding will be selectively offered to participants from developing countries, female researchers, and graduate student panel proposals.